This standard provides performance requirements for protective coating systems that may be used in aviation fuel handling systems (e.g. storage tanks, rail tank cars, road tankers, hydrant pipe, filter vessels and piping). It is intended to assist those involved in the storage of aviation fuel. 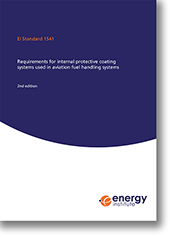 The provisions of this standard are intended for application to new aviation fuel handling systems or existing systems that are undergoing coating repair or replacement. Expansion of the scope to reflect the wider application of the standard in aviation fuel handling systems (e.g. storage tanks, rail tank cars, road tankers, hydrant pipe, filter vessels and piping). Deletion of the reference to MIL-PRF-4556 which is obsolete. Clarification that Test Fluid B should be a jet fuel meeting either ASTM D1655 or DEF STAN 91-91, without CI/LI, FSII or SDA. Extension of the test protocol for Test Fluid C (synthetic seawater) to also include visual inspection after seven days of drying. The inclusion of requirements for more photographic records of testing. Clarification that a full penetration weld rather than arc welding should be used as part of the lining burn back test. The inclusion of an annex that provides a test fluid to assess the impact of a 50/50 blend of FSII/water on coating systems that will handle jet fuel containing FSII. The inclusion of an annex that provides information that may be of assistance for the assessment of existing coatings of unknown provenance.